HAI Omnistat thermostats feature a sleek, modern case design that blends in with any décor. The large LCD display with "cool blue" LCD backlight shows time, temperature and operational mode. The controls are easy to use, with simple raise and lower temperature keys, mode (off, heat, cool, auto) and fan keys (on, auto). The Prog key is used for programming when the thermostat's internal scheduling features are used. 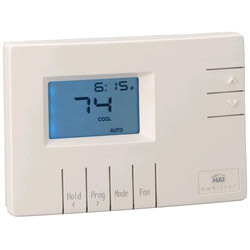 HAI Omnistat thermostats feature a multi-mode communications interface for connection to many types of home and building automation systems. This interface allows more comprehensive energy and comfort management by setting the thermostats based on occupancy and home or building modes along with traditional scheduling. Two full communications modes are available for connection to automation systems and personal computers. Two additional modes are available for simplified connection to most access control, security and time clock systems. Omnistat thermostats will work with any of HAI's Omni family home control systems. 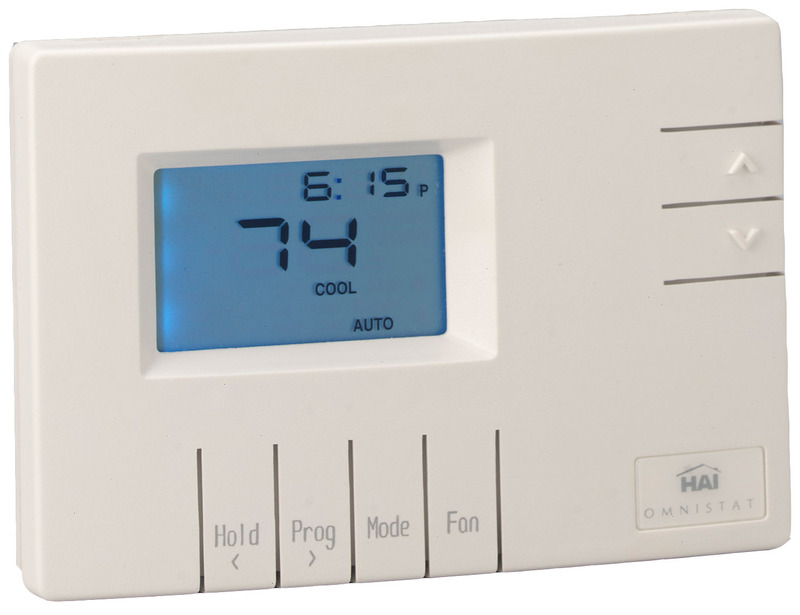 When used with an HAI home control system, full control of Omnistat thermostats is available on a Console or Keypad, OmniTouch touchscreens, telephones (with voice response) and over the Internet with HAI Web-Link II. The HAI home control system's advanced programming features add comprehensive energy management capabilities to one or more thermostats. The HAI home control system automatically sets the thermostat's time and displays the outdoor temperature when an outdoor sensor (available in Omni Accessories) has been setup. All Omnistat thermostats feature advanced logic for superior temperature control, including "anticipation" for maximum comfort. The installer can set limits on the heat and cool settings, to prevent the thermostat from being set too high or too low. The thermostat prevents short cycling, protecting the system's compressor. A filter reminder tracks running time of the fan, indicating when it is time to replace the filter. Two stage thermostat (2 heat/2 cool) with lighted LCD, accessories kit, manuals. Single stage (1 heat/1 cool) thermostat with lighted LCD, accessories kit, manuals. Support momentary the power on the HAI controller when the main power fails. 7 foot cable, modular to DB-9M - connects controller to serial ports for Russound, NuVo, RadioRA, Centrlite, Jandy. 7 foot cable, modular to DB-9F - connects controller serial ports to computer RS-232 port for use with PC Access, WebLink and Media Center. Omni LT controller with enclosure, RJ31X jack and cable, manuals, accessory kit. OmniPro II controller with enclosure, lock set w/ two keys, PIM, RJ31X cord and jack, manuals. OmniPro II controller board only. This Pack includes the best remote access control software for the HAI controllers. LCD surface mount console, silk screen front, connector kit, instructions. LCD suface mount console with built in speaker/microphone, silk screen front, connector kit, instructions. Wireless Recessed Door Transmitter is used for protection of doors and windows. Quad pet-immune motion detector with wall and ceiling mount hardware, battery, instructions. Wireless Glassbreak Detector is an omni-directional acoustic sensor and wireless transmitter. It is used for detecting the sound of breaking glass, providing 360º of coverage. HAI Snap-Link allows you to control your home from anywhere in the world that has an Internet connection. Programming software for HAI Omni controllers. Mini Door/Window 3 Zone transmitter with tiltswitch, magnet, mounting hardware, battery, instructions. 5.7" Color touchscreen in flush mount enclosure, includes white faceplates, connector kit and instructions. 5.7" Color Video Touchscreen in flush mount enclosure, includes white faceplates, instructions. Requires hub and video encoder, Cat 5 connections. Mounting plate, hardware kit, & instructions. Used to mount Omni LT controllers in Leviton and "Open House" type structured wiring enclosures. 433 MHz wirless receiver with LED display, instructions for HAI transmitters. Water temperature sensor module, probe, accessories, instructions. Extended range indoor/outdoor temperature sensor from -40° to 120°F (-40ºC to 50ºC), accessory kit, instructions. Extended range indoor/outdoor temperature from -40° to 120° F (-40ºC a 50ºC) and humidity sensor, accessory kit, instructions. Surface indoor temperature sensor for HAI Omnistat thermostats. Flush indoor temperature sensor for Omnistat thermostats. Control all of your HAI home control system's features using a single Media Center remote. End user programming software for HAI Omni controllers. Stainless steel outdoor keypad, cable assembly, instructions. Door/Window 3 Zone transmitter with tiltswitch, magnet, mounting hardware, battery, instructions. An easy way to obtain up to 60% discount on our products.